It’s been quite a while since xbox.com had a major update and today sees the launch of the new version with a clean new look and a whole host of new features that our teams here at LIVE engagement have been working on. There are a whole great new set of features, my favorites are below… note that some of these are not available in non-LIVE locales. Avatars are no longer just for the console but are escaping out onto the web and Windows Phone 7. With the new Avatar Editor you can create your own avatar or modify your existing one with a new easy-to-use interface from your browser. The new Avatar Marketplace lets you search and find cool items for your avatar to wear and try them on right-there in the search pages. Head on in either by game or by lifestyle (brands) (click the little grid icon to see sub-brands such as your own university’s sports team!). A brand new search function means we get much better results than before, fuzzy matching and some dynamic filtering options that appear on the left-hand side letting you dig down into family friendly games (e.g. by game ratings). When you visit the product detail page it now shows the images and streaming video inline (goodbye popups) as well as game add-ons showing which games they work with – useful for those music track packs! Our content teams can now put together collections of themed hand-picked games, add-ons etc. 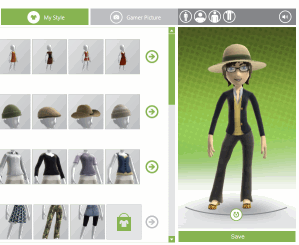 that you can you filter, sort and explore from such as the new Kinect games (gone) or family-friendly fun (gone). Gold and family gold members should keep an eye out for Gold exclusive offers or pricing! Okay, you could compare games before but the new UI is better and there’s a cool hidden feature that lets you compare against multiple people at the same time. To do this head into My Xbox’s Game Center and choose a friend to compare with. Now, notice the url at the top of the page? Put a comma after it and another gamertag to see three… or another comma and a gamertag to see all four (the maximum) side-by-side. New with this update is the Gold Family Pack (discontinued) which lets you get four gold subscriptions for $99 a year and lots of cool family features including play time reports, gifting points, allowances etc. There are a whole host of extra features to be seen at xbox.com including mobile-to-web gaming, improved messaging, simplified UI etc. so go check them out! People have been asking via Twitter and the LINQ to SQL forums so here’s a list I put together on a number of the changes made for 4.0. 25 Aug 2009 – Updated with additional changes, some of which are new in beta 2. If you are getting this exception where you weren’t previously it means you have an underlying foreign key with multiple associations based on it and you are trying to change the underlying foreign key even though we have associations loaded.Best thing to do here is to set the associations themselves and if you can’t do that make sure they aren’t loaded when you want to set the foreign key to avoid inconsistencies. There has been a flurry of posts and comments in the last 24 hours over the future of LINQ to SQL so I thought it would be interesting to provide some information on what the LINQ to SQL team have been up to and what we’re working on for .NET Framework 4.0. LINQ was a new feature in .NET 3.5 that provides a store-agnostic query language syntax using a provider model. As part of that initiative the C# team delivered LINQ to SQL – a LINQ provider to SQL Server with additional update and access management via DataContext and mapping tools such as the designer and SQL Metal. The result is a great lightweight solution that is easy to get started with and a good data access solution where your database and objects are closely aligned. Meanwhile Data Programmability worked on an initiative to provide abstraction between conceptual and physical models of databases to allow applications to operate independently of the database vendor and underlying physical schema. LINQ support was also added in the form of LINQ to Entities and it shipped with it’s management tools in .NET 3.5 SP1. Which now means we have two object-relational mapping options that overlap in some areas but with very different backgrounds. Some time before I started in May LINQ to SQL was handed over to Data Programmability. One of the first things you notice is that the overlap between the two object-relational mapping solutions Microsoft causes confusion and hesitation. Do I want something lightweight and easy or do I need the extra abstraction with a richer feature set? If I want to start with LINQ to SQL today but know that the database won’t stay under my control how would I move to Entity Framework? These are the questions that many developers face and our team spent a lot of time looking at the differences between the two stacks, how they behave and which features were missing if you wanted to migrate from LINQ to SQL to Entity Framework v1. We put together code samples, some helpers and documentation which are now being serialized on the ADO.NET blog and left us with a better understanding of the disparity – some of which the EF team have already addressed in v2. The decision has been made that Entity Framework is the recommended solution for LINQ to relational scenarios but we are committed to looking after our users and are approaching this in two ways. Firstly we are going to make sure LINQ to SQL continues to operate as it should. This doesn’t just mean making sure what we had works in .NET 4.0 but also fixing a number of issues that have arisen as people pick it up for more advanced projects and put it into production environments. Secondly we will evolve LINQ to Entities to encompass the features and ease of use that people have come to expect from LINQ to SQL. In .NET 4.0 this already includes additional LINQ operators and better persistence-ignorance. This isn’t to say LINQ to SQL won’t ever get new features. The communities around LINQ to SQL are a continuous source of ideas and we need to consider how they fit the minimalistic lightweight approach LINQ to SQL is already valued for. Where these suggestions fit with this strategy we will be working hard to get them into the product. Some enhancements like the T4 templates can be released independently but run-time elements need to stick to the .NET Framework schedule. LINQ to SQL will continue to work and EF will better address the needs of LINQ to SQL users with each new release.